This is the final installment of Ed Rempel’s series on active investing. In the last article, we introduced the concept of “Active Share” – the degree to which the holdings in a fund differ from the index – based on a study by 2 Yale academics. Here are some of the other valuable insights from the study. Low Active Share/Low Tracking Error: “Closet indexer”. These were the worst performers. Low Active Share/ High Tracking Error: “Sector bet”. These fund managers have many of the index holdings, but take big bets in sectors. These funds also underperformed with returns similar to “closet indexers”. High Active Share/Low Tracking Error: “Diversified stock picker”. They tend to have many holdings –but different ones than the index. They are often skilled stock pickers. Their funds move somewhat like the index just because they are quite diversified. They tended to outperform. High Active Share/High Tracking Error: “Concentrated stock picker:” They tend to have fewer holdings. These are the bravest fund managers, since it takes courage to both hold larger positions and be very different from the index. They tended to outperform. 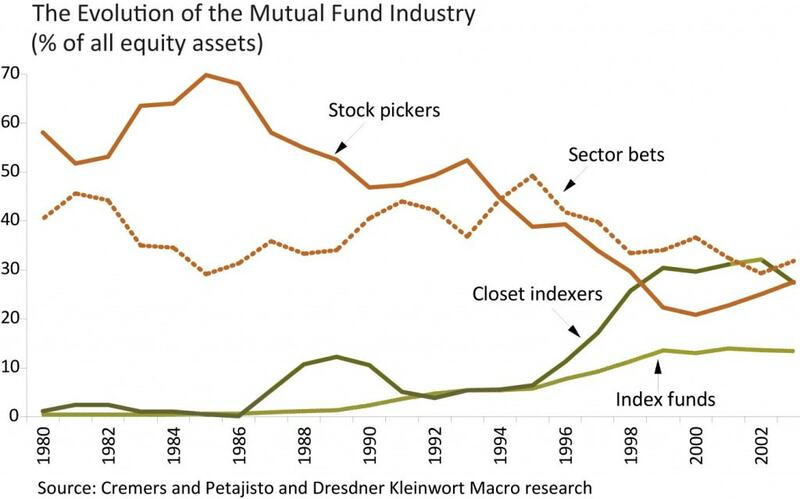 The study defines “closet indexers” as funds with an Active Share of 0-60%. The most negative aspect of the rise of index investing is that closet indexers have proliferated even more than actual index funds. They are now about 30% of equity mutual funds, up from virtually zero in 1980. In 1980, virtually all fund managers were truly active (very different from the indexes). Closet indexers obviously underperform! Their holdings are similar to the index, and yet they generally charge similar fees to truly active funds. They are probably the worst choice of equity investments, since you are probably not getting either a skilled fund manager or a low cost. I have to admit that my eyes glaze over when I look at a Canadian equity mutual fund with the top 10 holdings including 3 or 4 banks, plus a couple of the largest insurance, oil and gold companies. They have all the same holdings as the index, but a 2.5% MER! How can they possibly outperform? One of the main conclusions of the Yale study is that really nobody should own a closet index fund. You should either have a truly skilled fund manager (with a high Active Share) or a low-cost index fund, but nobody should pay the full cost of a skilled fund manager for a closet indexer. One common strategy for closet indexers is “window dressing”. They fill their top 10 holdings at month-end with popular stocks. Recently, Canadian banks have been popular so they may add them to their top 10 in the last day or 2 of the month, but then dump them right after month end. Despite this, closet indexers have become very popular for many reasons. Investment salespeople like them because they are easy to sell. Investors like to see big, solid companies they know in the top 10 holdings and are more comfortable during market declines if everyone else is down at the same time. Investors tend to think they are “safer”, but the study showed they are no less volatile or risky than truly active funds with totally different holdings. Most fund managers are just salaried employees trying to keep their jobs. They have learned that “You don’t get fired for owning Microsoft or Royal Bank”. They know that: “It is better to fail conventionally, than succeed unconventionally.” (John Maynard Keynes). You can usually identify closet indexers by the way they talk about being underweight or overweight some sector. It is hard to argue that they even try to outperform, since they try to have similar holdings and sector weightings to their indexes with much higher fees. The study defines “sector bets” as funds that try to outperform by being in the right sector, as opposed to picking the rights stocks. These funds tended to own companies in the index, but were heavily overweight in some sectors. They may be “sector rotators” or “market timers”. Think of it somewhat like actively switching between several sector funds or sector ETFs. Some investors today use a strategy like this by trying to market time ETFs in various sectors. The study showed that, while top fund managers can be great stock pickers, even top fund managers were not able to outperform by market timing sectors. The hardest part of finding skilled fund managers is identifying them ahead of time. It is easy to look at recent returns and see who performed best in the past. Part of the pitch by most investment salespeople to sell their investments is to show recent returns of the funds they are recommending. One of the main arguments for investing in index funds is that, while there are fund managers that outperform, how do you identify them ahead of time? Fund managers with high Active Share that outperformed the prior year and prior 3 years tended to continue to outperform, but this was not the case for funds with low Active Share. In addition, fund managers tend to maintain their Active Share. For example, most of the funds with an Active Share of 90-100% stayed there over each of the next 5 years. This does not mean that all managers with high Active Share outperformed, but the average fund in the group significantly beat their index even after all fees. To be clear, “active” managing does not necessarily mean they are buying and selling a lot inside their fund. A high Active Share means they the fund manager is “actively” picking stocks (not passively being an index). “Active’ does not refer to activity level but the degree to which the funds’ holdings are different from their index. The study does a long way to prove its credibility. The initial study was U.S. funds, which is the hardest place to beat an index. This is probably the most comprehensive study on the topic. It includes daily stock and fund values for 24 years, compares every fund to 19 different indexes, identifies index funds and closet indexers, and includes dividends and all closed funds (no “survivorship bias”). I wondered at first whether there was some hidden factor that would explain this. For example, perhaps the fund managers with high Active Share are buying smaller companies? The study exhaustively evaluates the contribution from many possible factors to see how they contributed to outperformance and to Active Share. They filtered the results for many factors, including size of holdings, size of fund, momentum, cash position, “tracking error” correlation to the index, turnover of holdings, expenses (MER), number of holdings, age of fund, manager tenure and cash in-flow/out-flow. The results showed that fund managers with high Active Share tended to outperform significantly even after taking all these factors into account. Size of fund: Managers with a high Active Share outperformed by wider margins with small and mid-sized funds, than in larger funds (over $1 billion). Expenses (MER): There was a slightly higher MER with managers with higher Active Share. Closet indexers tended to have MERs nearly as high as the top fund managers. You may have thought that lower fees would lead to higher returns, but the study showed that the top performing funds with high Active Share tended to have slightly HIGHER fees. Manager tenure: Experience makes a difference. The study showed that combining factors can make a much bigger difference. For example, for the smallest 10% of funds that have an 80-100% active share and outperformed the prior year, they beat their index on average by 6.5%/year after all fees! That’s a lot. The more different a fund is from the index, the better it tends to perform! Nobody should own a closet index fund. You should either have a truly skilled fund manager (with a high Active Share) or a low-cost index fund, but nobody should pay the full cost of a skilled fund manager for a closet indexer. c) However, for a retail investor to do this exposes them to an additional level of risk related to active manager choice risk and, for that manager, alpha-persistence risk. At the very least this requires the investor to spend more time and mental energy making the choice and tracking his investments than a low-cost passive indexing strategy. I’ve chosen to be a passive indexer because I’ve felt this extra risk and time is not worth it for me. I’m very intrigued by the results here, but they are not actionable for me until someone i) shows me the distribution of the active management performance premium versus index across different funds, and ii) explores the stability of this premium in time. That’s not a criticism – this is interesting work – but that’s what it will take for me, and I suspect at least some others – to change their allocation strategy. Thank you for bringing this research to our attention. It is an excellent piece. The one point that is discussed by you but I believe probably not emphasized enough is that these results are more applicable to smaller funds than larger one. It should also be noted that these results are American, which is a different market than Canada. In America, there is a never ending selection of ‘small cap’ stocks to pick from. Canada has a much more limited selection. More importantly, in Canada our ‘large cap’ stocks are also limited. This means that trying to be significantly different from the index while investing in large cap stocks in Canada is difficult. The large pension funds recognize this and tend to buy the index passively for large (‘core’) holdings and then seek out active managers for smaller niche markets (‘explore’). SPIVA actually supports the advantage of small cap managers in its findings. They note on a regular basis that smaller cap funds tend to have a better chance of beating the index. That said, you still need to find the manager that will beat the index in the coming years. It would be great to see a study done in Canada to provide us with the tool to select these managers! Finally, the one thing that time and again is not mentioned in such studies is the impact of taxes. Higher turnover active portfolios trigger capital gains on an ongoing basis while passive investing, by definition, defers taxes. This has a huge impact on wealth accumulation over time and should tip the scales in favour of passive investing. Thanks for bringing the article to our attention. Ah, call me biased, but I don’t like this article (or the last) and don’t agree with this study. There are too many points to debate from this article that I don’t even know where to start… so I won’t. All I know is that in the past 10 years, unlike most fund investors, when I sought to buy funds I would do extensive analysis and due-diligence. My findings was scary: My conclusion is that its a big scam and people should do their own investing. On average most funds will NOT do so great in the long run. If you take the average 7% gain and deduct the fees and then the inflation you are stuck with an investment which an ING savings account can match at no risk to your capital (OK, I’m exaggerating a bit). Another example for which you can try yourself. Grab a banks fund books. Search for 5 of the funds with the lowest fees. Go see your bank representative. Instead of opening your account and letting you invest, they will try to change all the chosen funds with ones that pay high fees… that’s because they are in the fee business and not the investing business. No matter where you go to invest in funds, they will always change your funds to their advantage!! There are still problems with mutual funds like manager turnover and style drift. But the active share concept may have some merit. In the book The Fearful Rise of Markets, the author recommends disclosure of active shares for each fund as a way to curtail closet indexing (and the herding behaviour it leads to). This was a good set of articles Ed, very well written, and I definitely agree that closet indexers are no good for investors. But my question still comes down to this, how do you select the high active share managers?? It sounds like it is not a strictly simple method, instead requiring a fair amount of research. When you factor in manager movement/turnover, you need to keep focused on your manager to ensure he doesn’t leave, and hopefully you are not locked in with deffered sales charges. For many people willing to put this much research in, you may as well be reading balance sheets and investing in companies yourself. From an effort/time outlook, passive indexing is a pretty big plus. There are more than 10,000 mutual funds in North America (http://www.investopedia.com/university/mutualfunds/mutualfunds1.asp). I completely understand the couch potato or lazy indexing approach, but researching my way through thousands of mutual funds to find the right one seems a bit ridiculous. Especially when there are only 10-20 blue-chip dividend paying stocks to choose from in Canada. It’s not rocket science to pick a basket of 6-10 individual stocks and hold them forever. And the best part, no MER. I commend you on your courage! I think people may have a bit of a problem with the terminology of active share. It almost implies an active trading portfolio such as used by day traders. I don’t believe this is the case. What I believe it means is taking an almost contrarian position to the actual combination of companies that compose the index or selecting the companies that will outperform. It means doing fundamental analysis and learning about the company. It requires skill and insight. By definition an index is a representation of the average performance of all the companies combined. By selecting companies that have fundamental value when they are unpopular and therefore low in price you can outperform those that buy every single company out there. A good example of an investor that uses those strategies is Warren Buffet. He looks for undervalued, unpopular stocks and buys them. It seems to have been a great strategy over time. His last buy was a railroad. Because of the skill and research involved in finding such stocks most of us are too busy to devote the energy to do it well. That’s why a low cost index fund is the best strategy for most people not because it isn’t possible to beat the market. These are key points. The funds as a group tended to outperform. The average fund is not a real fund that you can buy but the average of all the funds. They also make it clear that any one particular fund could have done very well or very badly. To get these same results, you would need to buy all of these funds to get the average. There is no accessible way to do this. We can also conclude that we should not be buying any one particular fund since its results can vary widely. None of this supports the idea of being able to pick all star fund managers which Ed Rempel is trying to promote. DogsFan said: It’s not rocket science to pick a basket of 6-10 individual stocks and hold them forever. And the best part, no MER. I echo this comment. You can have some great fun by building portfolios on Yahoo or other sites and seeing how they perform. You might build a portfolio of companies know to you (your bank, your utility companies, a few industries in your neighbourhood, etc.) without doing any financial performance review, choose a date in the past (say your 30th, 25th, 18th birthday) and see how your portfolio performs. You might be surprised at the performance! Interesting comments. We agree. Layering on additional emotion-driven momentum strategies on top of an investment choice the way most investors do generally reduces returns. Many professional investors do beat the index over long periods of time, but this is much harder for individual investors do to scale and depth of research. The Yale study did show that the outperformance of high Active Share fund managers was persistent and stable. Of the high Active Share fund managers, the average one continued to beat the index throughout the study. In addition, the fund managers with high Active Share tended to be the same ones year after year. The study did not tell us everything we want to know either, but it was not meant to be the one method of identifying the top fund managers. Active Share is one factor only. Many other factors are also very useful and should not be ignored in choosing a fund manager – such as the long term track record, experience, integrity, a strong discipline, being knowledgeable, usually not an employee of someone else’s company, track record in different types of markets, etc. However, Active Share does give us one additional very useful tool. In addition, it allows us to rule out many fund managers quickly. The article referred to smaller funds, it was referring to the size of the fund – not the holdings. Essentially, the largest funds (over $1 billion) generally did worse. This makes sense since many of these funds take a long time to buy a position in a company or sell shares in one company. For example, one of the largest Canadian equity funds takes on average 3 months to add or delete a holding. Large funds also cannot really buy a significant holding in a small company without taking over that company. However, the study did not show small cap holdings made the difference. The high Active Share fund managers tended to beat the index, no matter which index their fund most resembled. Both large cap funds and small cap funds beat the index. You are right that taxes are a factor as well. However, taxes are a much smaller factor than the return/risk of the investment. The total tax on an index fund over the years, however, is probably the same or HIGHER than on a mutual fund. In the end, the total gain is all taxable. The only difference is the timing of the gain. Index funds tend to have lower turnover, which can mean lower tax year-to-year, but this will also mean higher tax when the investment is eventually sold. For example, if an index fund and a mutual fund both double over 7 years and are then sold, the total tax over the 7 years is the same in both funds. If the mutual fund had distributions of 1%/year and the index fund did not, that means the mutual fund has a bit higher tax in years 1-6 and then the index fund pays the difference in year 7. In addition, the mutual fund can deduct its cost of operation against the taxable gains each year, which can reduce the long term tax. This is why the total tax on a mutual fund over the years might be LOWER than the index fund. For example, if your fund has a return of 10% with an MER of 2.5%, the fund actually made just over 12.5% on its holdings. If 1/3 of the holdings in the fund were sold during the year, then only 4% to 4.5% of the gain is taxable that year. Capital gains are only 50% taxable, so the taxable gain is between 2% to 2.5%. The fund then deducts the MER of 2.5%, so there is no tax on your 10% gain for the year. Meanwhile, a comparable index fund may make 10% and only have about 15% of the holdings sold that year (typical for index funds). Then 1.5% of the gain is triggered and the taxable gain is only .75%. The fund then deducts its MER of say .3%, which still leaves .45% taxable in the year. The point is that a mutual fund can have much higher turnover than an index fund before any tax is paid by the investor. Many mutual funds are also available in tax-efficient versions, such as corporate class structures, that minimize the tax over the years. Corporate class funds usually have funds of many types, so usually at least some are up and some are down. Then they net the gains that were triggered against losses to minimize the gains that will have to be paid. For example, if your fund made 20% one year and a different fund in the same corporate structure lost money, then for tax purposes your gain is netted against the loss that somebody else had, so you may be able to defer tax on the entire 20% gain. Corporate class funds can even allow you to buy and sell your fund without consequences. For example, any time you switch from one fund to another, you can decide whether or not you want that to be a taxable transaction by choosing whether or not to switch to another corporate class fund. This means you can trigger all the losses and defer all the gains. With effective planning, the tax cost can be very low over the years and even after you retire and withdraw money. For example, you can invest for growth for 20 years and then convert to an income fund when you retire without triggering any capital gains. With an index fund, there is often a much larger tax bill when you sell. This often leads investors to avoid adjusting their portfolio when there is a good reason because they do not want to take the tax hit. In general, index funds defer more tax until the investment is sold than the average mutual fund (mainly because most trade more). However, the tax planning provided by tax-efficient structures and being able to defer tax even when you change strategies is a significant offsetting tax advantage for some mutual funds. The point of this article is that it is not the average mutual fund that outperforms – just the average fund with a high Active Share. We agree completely that most of the financial industry is in the fee business of selling investments, not the investing business. The study even shows that there is little correlation between MERs and the quality of the fund manager. The average high Active Share fund manager only had a slightly higher MER than the average closet indexer. The key factor is your return after the costs, which means you need to get value for your MER (not necessarily the lowest MER). It does make sense that the top fund managers would not necessarily be the lowest priced fund managers, but much of the industry does not seem to be focused on the quality of the fund manager. You raise some valuable points. The study and our experience are that manager turnover and style drift would probably be much less of an issue with fund managers with high Active Share. Style drift usually means a fund manager is changing his style to whatever is currently popular in order to encourage more people to invest in his fund. This is the business of investing, not the profession of investing. Our opinion is that style drift would mainly be a factor with closet indexers (and possibly the “factor bets”). However, fund managers with high Active Share are probably not buying what is currently popular. The study also shows that these fund managers tend to maintain their high Active Share over the years. Our experience also is that the top fund managers almost always are not employees of someone else’s company. They have their own investing firm and get contracts with various fund companies. This makes sense since fund managers with their own firm generally make many times more than fund managers that are paid salary plus bonus for some big company. The study does not specifically address this, but our experience in searching for All-Star Fund Managers is that they don’t change funds much at all because they own their company. You think picking and monitoring your own stocks is easier than choosing a fund manager? Our experience is that once you do extensive research once, you can have quite a lot of confidence in the experience, professionalism, integrity and work ethic of a top fund manager. Then monitoring 2-5 fund managers is a lot less work than monitoring 20-100 individual stocks. I guess this is something that only comes from experience, but we have learned to have far more confidence in human beings than statistics when it comes to investments. Any statistics you research can change and most only reflect recent performance, but once you understand what a human being is about, you can have a lot more confidence in that. In fact, analyzing an investment only by looking a the stats/statements is always questionable. For example, if you analyze mutual funds in depth by looking at 100 or more different stats, you will likely just end up with the ones with good recent performance because recent performance is a factor in many statistics. Then you end up buying the funds that are currently overvalued (in favour). There is more an art than science to evaluating the best investments. I learned this earlier in my career when doing a ton of research kept just pointing to the recent performers, which often underperfomed as the market changed direction. You can’t get away from this, even if you are picking your own stocks. To analyze a company, you should really analyze the top management in addition to the financial statements, statistics, etc. Company management probably changes much more than fund managers. And to be diversified, you would need a lot more companies (20-100+) than funds (3-5+). Active Share is not publicly published (yet), but you can estimate it relatively easily by going through the holdings. It is only one factor in evaluating investments, but we find a real confidence can develop over time with a great fund manager that you can’t get with a bunch of individual stocks or even an index. Think of a person you know that you trust and have a lot of confidence in. Do you not find it easier to be confident in a person than a generality, such as the general benefits of an index? This is something we’ve been thinking about recently and probably only comes from experience or perhaps relates to changing ways of thinking in an internet generation. But we find the best confidence in investing comes from having confidence in a human being. If you are just choosing 10-20 blue chip, dividend-paying stocks in Canada, then are you not a closet indexer? Don’t you just end up with the index, (except much less diversification and excluding the growth stocks)? Good comments. You’re right Active Share does not refer to active trading, but to holding companies very different from the index. This often means holding the opposite of what the index has, in order to own under-valued stocks. As a general rule, the index will tend to hold more of the currently popular stocks. If the market cap (total value of shares traded) has gone up because of whatever made that stock popular, then it is more likely to be in the index. Generally, stocks jump about 10-20% when it is announced that they will be added to the index, so that is the premium investors have to pay for owning an index stock. Meanwhile, most of the best investors are value style, which means they are buying undervalued companies and waiting for the market to recognize their value. It’s interesting that you mention Warren Buffett’s latest addition being a railroad. He bought it shortly after the S&P500 removed it! Your definition of an index is not correct, however. Most people seem to believe that an index is all stocks. It is generally only 5-10% of the publicly traded. For example, there are about 4,000 stocks traded on the TSX, but the index is only 60 stocks. There are about 30,000 in the US, but the main index has 500. Indexes are essentially a mutual fund with specific principles – hardly any research, except size of company and number of shares traded, low cost, low turnover and diversification. But they are nowhere close to all stocks. We actually agree with you that the average person that does not want financial advice should buy broad-based index funds and hold them forever. Trading them is usually a disaster, as is holding index funds or ETFs other than the broad-based ones. I would not personally buy an index (and have never owned one), since I would be quite disappointed with index returns long term. We don’t recommend index funds to our clients for the same reason that nobody on our team has ever owned one – we are confident more confident in our fund managers. However, we agree that the average investor that does not want advice should buy broad-based index funds and hold them forever. Active Share is a good start, but there are many other factors in evaluating a good fund manager, so you should be able to narrow down the list. We found the Active Share study very interesting. Too many people believe that nobody can beat the index and too many people invest in closet index funds. We did find a lot of parallels with our approach in searching for All Star Fund Managers. You are right that they are not the same. The article is mostly about the study, but we have added comments from our experience to fill in gaps. We know the Active Share for most of our fund managers and virtually every one is very high (between 80-100%). Even before we found this study, we avoided funds that were similar or even just somewhat close to the index. I take it you agree that “it’s not rocket science” to beat the index. Do you find your method works, though? Are you not just choosing in hindsight? Just because a few popular stocks did well in a certain period in the recent past, does not tell you anything about potential future performance. In fact, since the market goes through cycles, whatever stock you pick by that method is probably more likely to underperform going forward. Even though you may be looking at a longer period of time, you are still selecting companies that have done well recently. If you are going to buy individual stocks, we would suggest that 6-10 is not adequate diversification (studies say a minimum of 20) and you should do some real research. For starters, make sure you are not just buying recent winners. Hi Ed, you can call it what you like (closet-indexer), but I just have no interest in growth stocks, foreign stocks, story stocks. I have no intention of selling, just collecting growing dividend income for my retirement. One of many problems with mutual funds is the fact that you have to sell them eventually when you need the retirement income. If you’ve just entered a market crash, or the market has gone sideways for years, where does that leave you when you need your money? The “all-star” funds may fair better than others, but that doesn’t help when you need to time the market to get your money out. With growing dividend income, I can withdraw $30k – $40k every year during retirement without ever eating into my capital. Yes, just buying Canadian blue-chip stocks is boring and I’m probably missing out on some terrific foreign stocks out there…but really, don’t be naive enough to think that local companies aren’t “global” too. They are diversifying themselves with investments across the globe, and are most likely much more skilled than I am. I’m going to stick with the companies that I know and that I do business with already, rather than throwing a dart at something in Brazil, Russia, India, China for their amazing potential – just so I can say I’m diversified. There are more than enough great dividend paying stocks to choose from in Canada, and if you have the patience to wait for them to be value priced, and the patience to wait for their dividends to grow over 15-25 years, you will end up with a pretty attractive retirement. If you are going to sell a service, then you need to show that you can accomplish the service. This involves more than a study showing that it is statistically possible. “Our experience is that once you do extensive research once, you can have quite a lot of confidence in the experience, professionalism, integrity and work ethic of a top fund manager. Each of those stocks is run by an individual as well. Why don’t you just research the people running 2-5 companies and follow up on them? You imply that everything is easier just by being a fund but underneath the blanket of each fund is many stocks. Investing in funds is actually harder because you have to understand both the fund management and all the stocks. Your dividend strategy is quite sound. Many investors buy them when they are popular (like now), but then abandon them in strong growth markets when they lag. I can still remember the late 90s when investors dumped any stock that paid a dividend, because dividend stocks are not growth stocks. If that is your strategy, stick with it, even in the next bull market. Once you retire, you may need to look at other strategies. With the various clawbacks on government income programs in addition to income tax, dividends are taxed extremely highly for seniors in certain tax brackets. For example, for seniors with only CPP, OAS and dividend income, the first $10,000 of taxable dividends have a 72% GIS clawback in addition to income tax. That is not an issue for all tax brackets, though. Your comments about mutual funds are not accurate, though. There is no need to time selling funds. There are various ways to get income from mutual funds. You can automatically sell a bit every month (SWP), receive a tax-efficient monthly distribution, or even get a 6% eligible dividend paid monthly – whichever makes the most sense in your situation. By the way, studies partly support your comments are partly not. Local companies being “global” is not really relevant, since studies show that companies with international operations are usually just correlated to their local stock market, and not any foreign market. However, studies also show that stock markets in high-growth countries do not out-perform stock markets in slower growing countries. I just wrote 2 articles about economies and the 2nd one explains this. The purpose of this article is just to point out that too many people wrongly believe that nobody can beat the market, and that many people are buying the wrong mutual funds (such as closet indexers). I also disagree that there is a need to study stocks when you invest in mutual funds. That is the whole point of investing with a good fund manager. We focus on studying the fund managers. Once we have confidence in them, we let them make the specific investment choices. There is no need for us to study the stocks they hold, except as part of understanding the process the fund manager is using. Researching hundreds of stocks in a constantly changing environment to identify the best ones would be exhausting! We don’t spend time doing that because we are confident in our fund managers and they have already done far more research on stocks than most investors. A good fund manager will do some real research. Doing a 100+ page report on every stock they own is common. What most amateur investors know about their stocks can usually fit on a post-it note and usually involves only looking at publicly-available information (such as anything you can find on the internet). Unfortunately, many investors underperform because their research is just looking at the same information that everyone else has. High Active Share mutual funds outperformed the index before and after fees and outperformed sector bets. Complicated study but the data speaks for itself. Previous post: Taking Vacations Can Make You Money?